special to families in need. You may drop off the toys to be donated in the bin outside of the Hospitality Room or bring them with you to the Worship Service on Sunday, November 18. Visit the Yates Baptist Association website for a complete list of suggested toys or contact Robin in the church office for a list. Volunteers are also needed in the store. To volunteer, please contact Michael Bond . Worship, in many ways, is like a family meal. Individuals in a family can, and sometimes do, eat separately. However, there is deep enjoyment in sharing a meal with loved ones. Likewise, we sometimes worship independently and spontaneously, enjoying moments of beauty, peace, and joy as they occur. But if we never worshiped together as a church family, then we would miss an important element—the love present among the members of God’s family. The Church is not so much a place as a People, and young and old, we are called by God to be children of God. Young and old, we are called to gather with the community of believers in Jesus Christ, to listen to God, and to seek and serve God. Young and old, we offer our gifts to God and seek to leave our places of worship renewed in our faith and strengthened to serve the world. the book Growing Young attests, young people have three ultimate questions: “Who am I?”, “Where do I fit?”, and “What difference do I make?” By helping them see “the beauty and truth, the meaning and purpose of what we do in worship” and providing them with the opportunity to “become more involved” in corporate worship, we can help answer these questions. 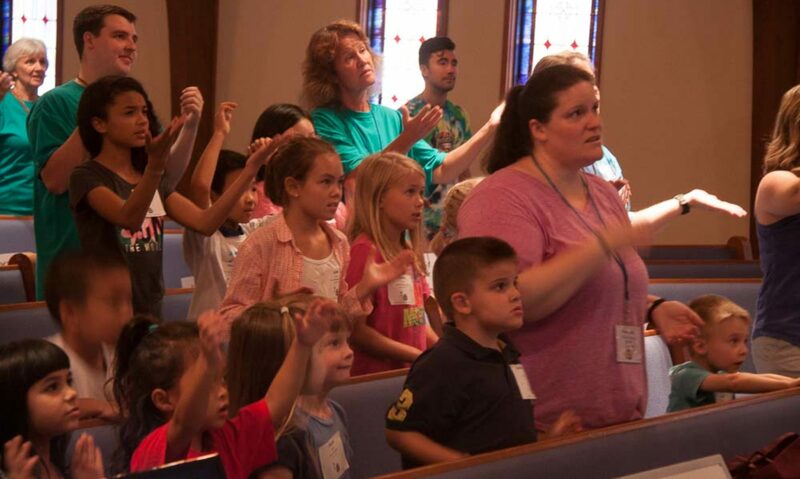 Beginning in October the youth and older elementary children at Hope Valley will have the opportunity to take part in a new discipleship program: Worship Apprenticeship. Designed to help our young people both learn about and practice the many different jobs/roles that contribute to our corporate worship experience, the primary purpose of the program is to not only help our youth and children feel “more at home in the Church,” but also help them to see Church as a place where their presence and their contributions are valued. Please join me in praying for and encouraging these younger members of our church family as they develop and share their gifts and talents in worship leadership. After being connected by Lawrence, I met with Luke Perrin, and a couple weeks later, Luke interviewed with our Personnel Team and Youth Council about the possibility of serving as an intern with a focus in youth ministry. We have presented the idea to the Finance Team and Deacons, and both groups have joined Personnel and the Youth Council in recommending that we move forward with this internship. We will be having a Family Meeting after worship on Sunday, October 7, to present this proposal to the church for a vote. Religious Liberty in Washington, D.C. He is a senior at NC State and plans to attend Divinity School in the fall of 2019. He has worked on staff of the Technician – the NC State student newspaper for several years. In addition, his mother is a minister who has served on the ministerial staff of several churches in NC, so he has a good understanding of the dynamics of church life and loves the church. I am very impressed by Luke, his energy, his ideas, and his gifts for ministry, and I really believe that he could be a wonderful resource for our youth while we are seeking to determine what we can afford and what our longer-term options are for youth ministry at Hope Valley. I invite you to join me in prayer as we consider this possibility. Saturday, September 29: North Carolina Food Bank. We will be working in their warehouse from 9:00AM until 12:00PM. Contact Jennifer Bowen for details. Saturday, October 13: We will visit the New Hope Valley Railroad in New Hill, NC for Track or Treat Halloween Express! Tickets are $15. Please contact the church office by Friday, September 28, if you would like to go. Families are invited as well as youth. You may drop off any of these items at the church office and we will get them to the proper place. If you would like to make a financial donation, please make your check out to Hope Valley Baptist Church and place it in a contribution envelope marked “hurricane.” You can also donate online via the Baptists on Mission website. Are you “On the Hill” and not yet subject to “Over the Hill” jokes? Did you go to school in the days of neon clothing and Members Only jackets? If you are a young or median adult, we have a get-together for you! On November 10, from 5:30 – 8:30PM, we are having a game night. Bring a food to share (chips, meatballs, cookies, etc.) and get ready for a roaring good time. Have small children, NO PROBLEM! We will have some of our wonderful youth on kid-duty in a fully stocked toy room. Please contact the church office for details! Join us for Hope Valley’s Annual FALL FESTIVAL & Trunk or Treat on Saturday, October 27, 2018, from 4:00 – 7:00 pm in the Family Life Center/Gym!! Invite your family and friends to come and join the fun! There will be enjoyment for all ages!! A few fun-filled highlights will be: bingo, cake walk, game booths, and more!!! !